An old-fashioned looking sweet pea, with room-filling fragrance. Beautiful collection of colors. The large flowers have ruffled, bicolor petals on 8-12" stems, which makes them wonderful for arrangements. Plants are heat tolerant. GARDEN HINTS: Sow near a fence or trellis, in a sunny area, as soon as the soil can be worked in the spring. Plants grow best in cool weather. Mulching is recommended to keep soil cool and conserve moisture. 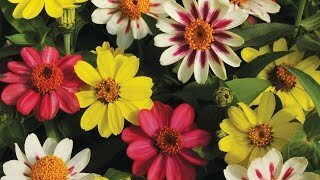 For earlier bloom, start seeds indoors, in a cool location, 6-8 weeks before last heavy frost. In the Deep South, Gulf and Pacific Coast areas, sow seeds from fall to early spring. Sweet pea seed has a hard seed coat. To aid germination, soak the seed in water before sowing. Direct sow seeds in average soil in full sun in early spring. In frost-free areas, sow from fall to early spring. Sweet peas are climbers, and need some sort of support around which they can wrap their tendrils. They can climb a fence, trellis or even strings. Dwarf cultivars need no support. Sow seeds 3 inches apart and cover with 2 inches of fine soil. Seedlings will emerge in 10-14 days depending on the soil and weather conditions. Thin plants to stand 6 inches apart when plants are 1 to 2 inches high. Do not fertilize unless the plants are showing a nutrient deficiently. If you over fertilize, sweet peas may produce lush foliage at the expense of flowers. Remove spent flower heads to keep plants flowering. Sweet pea vines need little care and are easy to grow. In the cool weather of spring, sweet peas add a wonderful old-fashioned feel to flower beds, trellises, and containers. Fragrant flowers are excellent for cutting. Sweet peas perform best in cool weather. They can tolerate a light frost. Sweet Pea, Sweet Dreams Mix is rated 3.6 out of 5 by 10. Rated 5 out of 5 by Cheals12 from Easy to grow For my first time ever growing anything, it was easy and the results were beautiful. They smell good and beautiful to look at. Rated 5 out of 5 by Maria Tough its my name from Sweet peas The package was delivered quickly. The plants came up very fast and were transplanted outside. However, nothing against the plants but the rats ate all of them. Rated 5 out of 5 by CaitlinsCrops from Gorgeous flowers! Hands down my favorite flower in my large garden! I planted directly in the soil along the corner and sides of my raised bed. Germination was quick and impressive, after the seedlings were 2 weeks old I covered with 3 inches of mulch. I stuck a few bean poles along the edges of the bed with cheap, fabric trellising. They all fly right up to the top (6ft) with only minimal coaching. They make the whole garden smell great! Will definitely replant next year!! Rated 5 out of 5 by spud8 from Great little seed. I live in the 5a-6b region, and I got my Sweetpea seedsalmart where I work. I didn't have a clue as to what I was supposed to do with these seeds just loved the name, so I purchased them. I planted them as directed on the package with my Miraclegrow potting soil and some Humus. I didn't think they would grow, but to my surprise they are coming up! I'm as pleased as punch and am so excited! I'm keeping the soil moist as directed and hope they can soon be transplanted into my now garden that I have put in my backyard. I also purchased the Nasturiums seeds and planted them just like I did the Sweetpea seeds and they are also coming up! Couldn't be happier with my Burpee Seeds. I will definately purchase some of the plants they all look so healthy and well cared for. Kudos, Burpee!! Rated 1 out of 5 by melintdesr from Never Germinated I planted these right in the garden and they never sprouted. Maybe I had a bad batch? I had obelisks for them to grow up, and am trying climbing nasturtiums in their place. Hopefully they will take! Rated 5 out of 5 by aspen from easy togrow The way to get these seeds going is to put them on top of a very wet paper towel overnight in a plastic tray. You should keep the tray moist by checking on it once a day for 2 days. When the seeds crack, then you should take them out to the garden for planting. Finally, once you cover the seeds with a light soil, water them, and then lay a plastic "flat"-those you take home with you when you buy a lot of plants-and keep the flat over the seeds until the plants get a few inches high. Otherwise the birds and critters will scoop them up without your knowing about it and you'll think the seeds did not grow. I do this with sunflowers and snap peas as well. I LOVE planting these sweet peas and they do return every year if you let them die out and throw the seed pods back into the soil.